This week in the NFL was not wild at all, but I still somehow found ten observations from this weekend of games. A couple of weeks ago, I said that the Bills are one of the betters teams in the AFC, but they have not looked good since. They got their doors blown out by the Goddamn Jets on Thursday night and it looked like the team had basically quit after losing in a dance battle during a timeout. The AFC is wide open so the Bills have the time on their side to figures things out and get back in contention. The Jagaurs came of the bye week, which meant they did not lose on an even week and they suspended their best player on offense just minutes before the game on Sunday. The Jaguars controlled the game from start to finish despite not having Leonard Fournette and it makes you wonder can Alabama beat the odd week Jaguars? Number 8- Why have the Giants not fired every single employee yet? In my preseason previews, I said that that the best teams in the NFC South, would be the Falcons and the Bucs. Both of those teams are trash while the Panthers and the Saints are two of the best teams in the NFC. Both teams have the quarterback to make a run and the league is still wide open despite the success of the Eagles, maybe a Super Bowl team will come out of the NFC South for the third year in a row. The NFL is straight up trash, there is only like two good teams and I do not even think they are unbeatable. The AFC Wild Card is wide open and if the Jets can just go 8-8, which is not that hard based on their schedule, then they will go to the playoffs. Forget rebuilding for long term future success, sign me up for a blow out loss in the Wild Card game instead. Number 5- Can you have a moral victory on top of actually winning the game? The Redskins had the most impressive win this week while all the odds in the world were stacked up against them. The Skins are ravished with injuries and have put together an offensive line of players that should not be starting in the NFL, and they have other major injuries every where on the field. The Redskins played in Seattle, which is the toughest place to win in the NFL, and somehow won the game over the Seahawks. The Redskins need to get healthy before thinking playoffs but this game certainly helps increase the team’s morale. On the other side of the Redskins game, the Seahawks are in all sort of concerns. The Seahawks could not win an easy game at home and now have some injury concerns on the secondary while the offensive line is still struggling. The Rams are really good in their division, so the time is running out on the Seahawks returning to their normal form. Number 3- Is the whole AFC West trash? We already knew that the Chargers and the Broncos were basically trash but the Raiders and the Chiefs might have joined them. 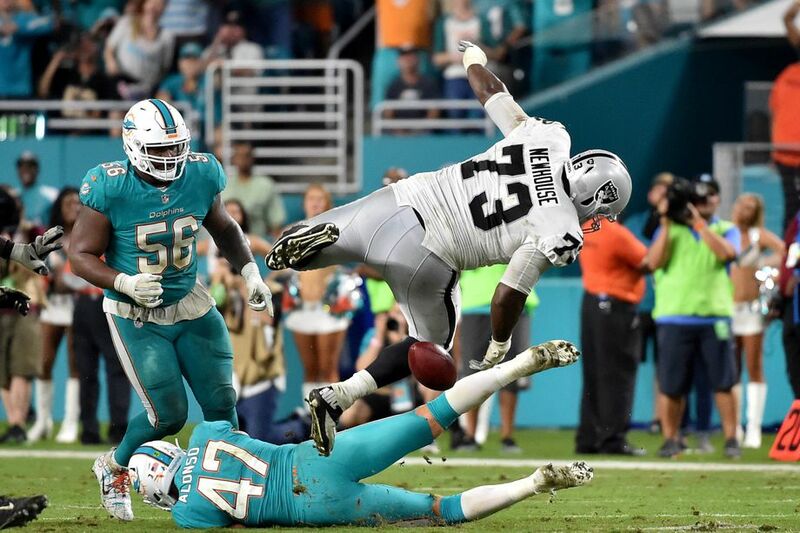 The Raiders had a hard time beating the lowly Dolphins, while the Chiefs got blown out by the Cowboys. Early on, this division looked like the best in the NFL, now any of the four teams will run away with the divisions if they can get to 10 wins on the season. Number 2- Jared Goff and Carson Wentz are going to be the quarterbacks of the two teams in the NFC championship game? The two best teams in the NFC had blow out statement wins this weekend. The Rams traveled all the way to New Jersey and could have easily won the game by fifty points over the Giants, while the Eagles continue to dominate at home. Nobody expects either of these teams to get to the Super Bowl, but both teams are passing every test with flying colors thus far this season. There were two major fights this week that show why NFL is so violent. The first one was in the Bengals-Jaguars game in which AJ Green was waiting outside the Jags’ locker room for Jalen Ramsey after both players were ejected. The other fight was in the Bucs-Saints game in which Jameis Winston started a fight while injured on the sideline and Mike Evans threw a cheap shot on the Saints’ player. Both Winston and Evans will be missing the Jets’ game on Sunday due to either injury or suspension, so the Jets have the perfect game to have a let down against a really trash team.